The epoch was subject to broad swings in temperature, swings that gave rise to growth and decay of glaciers. During the epoch, humans were hunters and gathers. They spread out and established tentative footholds in far corners of Earth. The booming migrations were due to growth in human intelligence, which led to a multiplicity of advances in technical skills, especially in usage of fire, language, cooperative hunting methods, and the making of weapons for hunting. The Holocene epoch began only 10,000 years ago and continues today. It is an interglacial period, a time in which glaciers have largely disappeared. Holocene geography is most notable for the domestication of plants and animals by humans. Agriculture led to a dramatic rise and spread in human populations, tool making, food production, and human influence on the environment. Quaternary geography is the study of the changing relationships between people and the environment during the Quaternary period. Geographers and other scientists— particularly anthropologists—use evidence from fossils, sediments, ice cores, tree rings, peat bogs, weather records, vegetation, and artifact dating to reconstruct changes in relations between humans and the land during the Quaternary. Quaternary geography has taken two tracks. Research on the Pleistocene focuses on impacts of climate change on the environment and on early human evolution and migrations. Holocene research focuses on the rapid rise of humans as superior agents of environmental change. The following is a summary of changing human-land relationships during the Quaternary period. Temperatures of the Pleistocene fluctuated between greenhouse and icehouse conditions. Swings in temperature varied in magnitude, but in total, there were more than 20 glacial advances (glaciations) separated by intervening periods of warming. Nearly all the glacial ice was in the form of enormous continental ice sheets. Ice sheets spread out over CANADA, GREENLAND, Scandinavia, and eastern SIBERIA in the Northern Hemisphere and ANTARCTICA in the Southern Hemisphere. 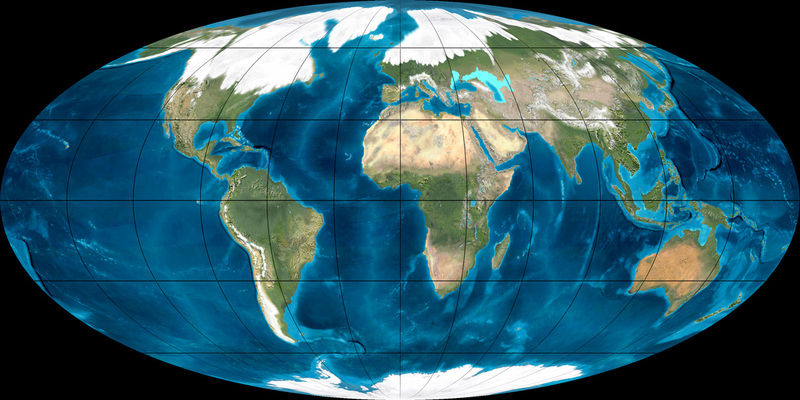 During the last Pleistocene advance, ice sheets were up to 2.5 mi (4 km) thick. During times when the glaciers were at their maximum size, roughly 5.5 percent of the world’s water was in the form of ice (the corresponding value today is 1.7 percent). When global temperatures plunged to icehouse conditions, the ice sheets grew at the expense of oceans, causing sea levels to fall by up to 500 ft (150 m). During such glacial advances, shallow areas between continents and adjoining islands became land bridges. These land connections allowed animals and human ancestors to migrate great distances from their areas of origin. Pre-Pleistocene geography is notable for its legacy of early hominids (human-like apes). Hominids were the first upright-walking animals. They originated on the edges of forests in a volcanic region of East Africa about 4.0 mya. Pollen records in the region suggest that pre-Pleistocene glaciations created cycles of cooling and drying in Africa. Anthropologists believe that climate change, in turn, caused forest habitat to break up into grassland and forced biological advances in our early ancestors, including bipedal walking, which freed up the hands for complex tasks, such as gathering and carrying seeds and fruits and making and using tools. Although anthropologists are still seeking more fossil links, they have accumulated enough artifacts and other evidence to demonstrate an evolutionary line from the hominid Australopithecus africanus to us. The lineage includes two intermediary hominids—Homo habilis followed by Homo erectus—before Homo sapiens, or true humans, appeared. The earliest evidence of Homo habilis comes from East Africa and dates to between 2.4 and 2.0 mya. This hominid was the first toolmaker, although the tools were primitive stone scrapers. No evidence suggests that Homo habilis migrated out of Africa. By mid-Pleistocene, about 1.0 mya, Homo erectus had replaced Homo habilis. The use of fire (probably from volcanic origins) enabled this human ancestor tospread out of Africa and into latitudes that are more northerly. Homo erectus also migrated east, across Asia as far as Java. Homo erectus evolved into Homo sapiens, but the timing of the latter’s appearance is still being debated. The earliest unquestioned evidence of human remains stems from Africa and Europe, where skulls and crude stone tools date to 0.5 mya. Around this time, the population of Homo sapiens may have included Neanderthals, but anthropologists sometimes classify them as a separate species (Homo neanderthalensis). Skeletal, artistic, tool, and tool-making evidence proves that the Cro-Magnons of Europe were the first fully modern humans. The Cro-Magnon population grew and spread out rapidly from Europe beginning about 50,000 years ago. The earliest undisputed proof that humans reached far-flung New Guinea and AUSTRALIA dates to about 30,000 years ago. The least contested evidence indicates that humans reached South America, the farthest destination from Africa by land, roughly 11,000 years ago. Genetic and linguistics studies suggest that, as early migrations took place, geographical isolation gave rise to racial and language groupings. A glut of large mammals became extinct as the Pleistocene epoch ended. Their disappearance may be the first serious human impact on the environment. The list of mammals lost includes nearly 60 species, among them were mammoths and mastodons (larger than modern elephants), horses the size of Clydesdales, camels, giant ground sloths, saber-toothed tigers, and beavers as large as modern bears. Before their disappearance, humans fell prey to some of these mammals. There is no clear explanation for these particular mammalian extinctions, but many scientists argue that was due to a convergence of climatic change and improvements in human weaponry for hunting purposes. Evidence for human weaponry causing the extinctions is clearest in America. The cold of the glacial maximum was so harsh for some warm-blooded mammals that they had to concentrate in whatever warm habitats remained. Simultaneously, humans began making Clovis points for spears. (The points are sonamed because archaeologists discovered the points first near Clovis, New Mexico.) Assiduously fashioned from stone, this double-edged point—when lashed skillfully to a throwing spear—gave humans the advantage they needed to kill dangerous prey at a safe distance. Many archaeological sites in America have yielded evidence of massive overkills by spear-wielding Clovis hunters, but there is some evidence in America and elsewhere to suggest that climate change may have been the main cause of such extinctions. There is an ongoing debate as to the ultimate cause of mass extinctions in the late Pleistocene—overkill or climate change. The great northern ice sheets were virtually gone by the beginning of the Holocene (10,000 years ago), only a withering GREENLAND ice sheet remains today. (The only other existing ice sheets cover Antarctica in the Southern Hemisphere.) In response to interglacial warming, mixed woodland replaced barren tundra over large areas of Europe and North America and global sea levels rose significantly. Moreover, a combination of climatic and vegetation changes affected stream activity, weathering rates, and soil formation. The same warming extended the geographical range of large grazing mammals, edible plants, seeds, and fruits. The geographical extension of animals and plants aided the spread of humans living in sedentary farming communities. The adoption of agriculture by people took place first in the FERTILE CRESCENT about 11,000 years ago. Today, tributaries of the Tigris and Euphrates rivers in borderlands separating IRAQ, TURKEY, and IRAN drain this lush arc of foothills and valleys. Main diffusions of food production were from the Fertile Crescent region to Europe, EGYPT, ETHIOPIA, Central Asia, and the Indus Valley. Later independent discoveries and diffusions of agriculture took place from the SAHEL and West Africa to East and southern Africa; from CHINA to tropical Southeast Asia, the PHILIPPINES, INDONESIA, KOREA, and JAPAN; and from Mesoamerica to North America. These dispersals forever changed the face of Earth by bringing new plant and animal species to new areas. Moreover, in the process, agriculturalists cleared vast areas of natural vegetation to make way for the new crops and livestock. Agriculture made possible the feeding of much larger human populations in many regions. It also opened the way for complex societies in which individuals could specialize in activities other than food production. Specialization led to the INDUSTRIAL REVOLUTION of the 18th century. Industrialization resulted in an explosion in human population. The present list of environmental problems brought about by industry and population growth is daunting: disappearing forests, plant and animal extinctions, soil degradation, overgrazing, acid rain, water and air pollution, and ozone depletion. Moreover, a large body of scientific evidence suggests that burning fossil fuels and forests has led to excess accumulations of carbon dioxide and other greenhouse gases. The excess gases, in turn, are raising global air temperatures, causing remaining glaciers to melt, sea levels to rise, and ecosystems to change.